BROOKLINE, MASS., DEC. 30 — A gunman dressed in black opened fire with a rifle at two abortion clinics here this morning, killing two female staff workers and wounding at least five other people. This matter-of-fact sentence was the opening of a Washington Post story on December 31, 1994. Today marks the 20th anniversary of these shootings at the Planned Parenthood and Preterm Health Services clinics in Brookline, Massachusetts, just outside of Boston. The Brookline shootings are generally considered the third in a series of assassinations by anti-abortion activists and followers, beginning with the murder of Dr. David Gunn in Pensacola, Florida, in March 1993. A history of acts of violence compiled by NARAL frames Dr. Gunn’s killing as a turning point, while recognizing that violent acts were happening all through the 20 years since the Roe v. Wade decision in 1973. 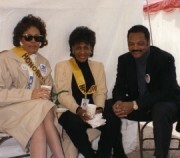 Faye Wattleton was president of Planned Parenthood Federation of America from 1978 to 1992. She was generous enough to speak to me on January 7, 2013, and throughout the month of February we’ll be sharing her experiences and perspectives in observance of Black History Month. This third installment covers questions of racism, especially as aimed at Planned Parenthood and its founder, Margaret Sanger. Faye Wattleton is clear that women’s autonomy is at the core of the reproductive rights debate. Her philosophy regarding the struggle for reproductive rights, as she said during our interview, “gradually evolved to the conclusion that this is still really about the fundamental right and values that women are held to. That our reproduction is still a proxy for the larger question of our full status as human beings and as citizens.” The question is whether the government will seize the power to make decisions about women’s bodies. Posted on August 10, 2010 by Anna C.
The July 18, 2010 issue of The New York Times Magazine has an informative article titled “The New Abortion Providers,” which puts the spotlight on upcoming doctors and the need to include abortion-care training in medical school curricula. As the article points out, in 1973 more than 80 percent of the nation’s abortion facilities were located within hospitals; by 1996 more than 90 percent of abortions were taking place in clinics. The move from hospitals to free-standing clinics made the abortion provider more vulnerable. 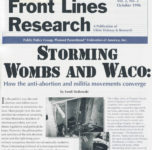 This weakness was exploited by groups such as Operation Rescue, whose tactics include the harassment of doctors, as well as terrorists who single out abortion providers for assassination.